So this one is from my history teacher, whom I've had for two years now. He's always written notes like this and it has always bothered me. When I saw your blog I was like, "Yes! Other people understand!" So I had to get a picture of it. 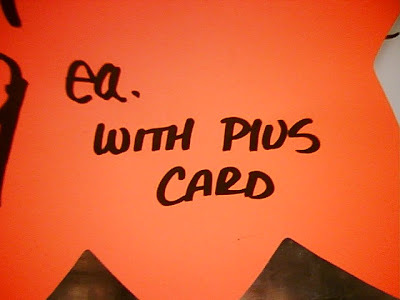 Plus, his handwriting is horribe which just adds to the overall annoyance factor. Sorry about the quality of it, sort of a spur-of-the-moment decision and all I had was my phone. 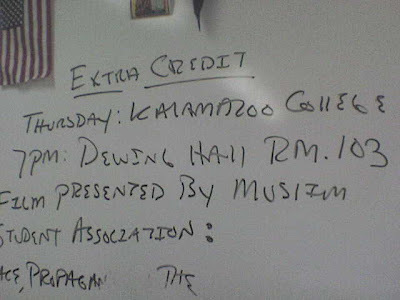 KAlAMAZOO COllEGE is pretty great, but I wonder what film was presented by the MUSlIM STUDENT ASSOCIATION ... maybe New Muslim Cool? Either way, what I especially like is that the professor took extra care to serif the capital i in MUSlIM so it is distinctly i-ish, but made the L extra lowercase. This is a fundamental Muslim mistake. I spotted this graffiti on the Williamsburg Bridge a while ago: OlD people think, adult's assume, kid's know. Know what? Not how to use apostrophes for plurals vs. possessives, that's for sure. This was probably written by one of Williamsburg's finest. Over the weekend here in NYC, Rooftop Films showcased New Muslim Cool, a documentary film about Puerto Rican American rapper Hamza Pérez and his journey from drug dealer to religious Muslim. The movie, directed by Jennifer Maytorena Taylor, is getting impressive international recognition, and is even being featured on POV on PBS. 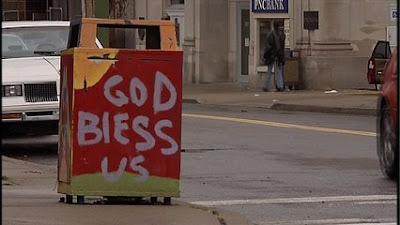 But would the film be getting this much attention if it had not been for this production still of the words GOD BlESS US written with all uppercase letters — except for the L — in graffiti on a public trash can in the North Side of Pittsburgh? This is not the first case of a graffiti BlESS! 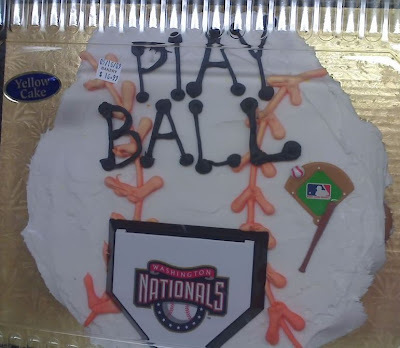 Discovered on Cake Wrecks, a blog devoted to terrible cake designs, Linda honors us with a Father's Day find. 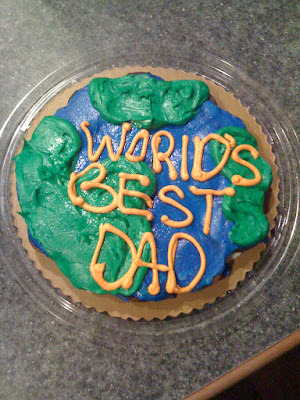 At least this cupcake for the WORlD'S BEST DAD got the apostrophe right. 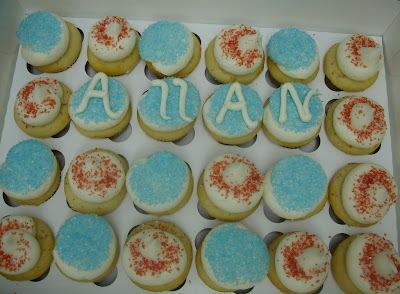 It looks like the cake decorator forgot that he was writing on a cupcake, and didn't realize he was running out of space until it was too late. Check out some of the other Father's Day cakes on Cake Wrecks. The lowercase L may be the icing on the cake, but the FAtHER'S DAY ONLY with its mysterious capitalization certainly takes the cake. Leo X Daniels found this bevy of bastardized BBC badges at a recent training event. These name tags were for some of the employees who did not show up, including SHAWNY BUCKlEY, DANIEllE HENDRY, SARAH WIlCOCK, BEN EAGlETON, and ClAIRE WAlKER. Leo especially liked the CHARlOTTE COOK tag, and thought it would have been nice to meet someone with a name like Chariotte. But I suspect these no-shows didn't make it to the training session with good reason. 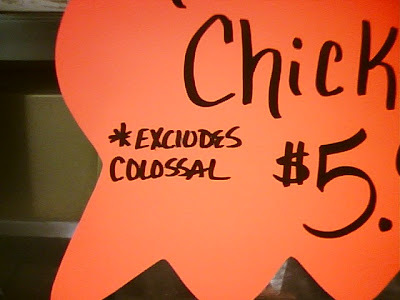 I found this at Tops on the Waterfront in Williamsburg, Brooklyn. 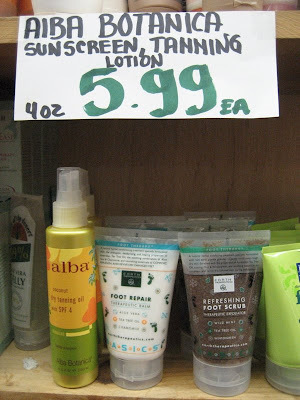 The bottle may say alba, but that AlBA BOTANICA sign definitely says "Aiba". No question about it, no excuses. And the price is 402 S.gg each. 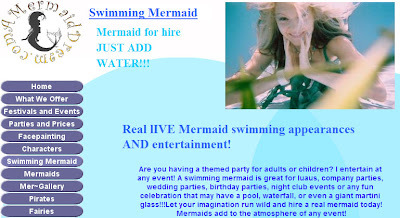 Paul A. found this fishy ad for Real lIVE Mermaid swimming appearances AND entertainment! Looks like a case of delayed caps lock, which may be true of all ONlINE examples. At the time of writing this post — embarrassingly, more than six months after receiving Paul's wonderful tip — the website still boasts the lowercase L, so check it out lIVE. I wonder how long it will last now that the jig is up? If you live in New York, don't forget about the Mermaid Parade on Coney Island, June 20, 2009.